The Naked 2 palette is the second edition to Urban Decay’s Naked Palette. It comes with 12 eye shadows in various colors (gold, deep brown, gun metal, taupes just to name a few) and finishes (deep, matte, and shimmery). Whether you are going for a natural/neutral look or smokey-dramatic look, the Naked 2 palette is a sure way to achieve both. For this look, I decided to go a little on the smokey side paired with a soft-pink lip. I personally would rock this as a day or evening look, but it’s definitely your preference. 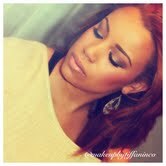 Check out the video below on how I achieved this smoked-out look using the lovely Naked 2 Palette. All products are listed below as well. Thanks for watching!! Be sure to follow me on Instagram @makeupbytiffaninco and www.youtube.com/tiffaninco for updates and new videos! Looks absolutely stunning! Great tutorial. Lol Thanks to my Sister! Great tutotiral! Angel lipstick looks gorgeous on you, I have to try it! Next Next post: Qiana, Danielle, Tiffani & Cooking….Oh My! !